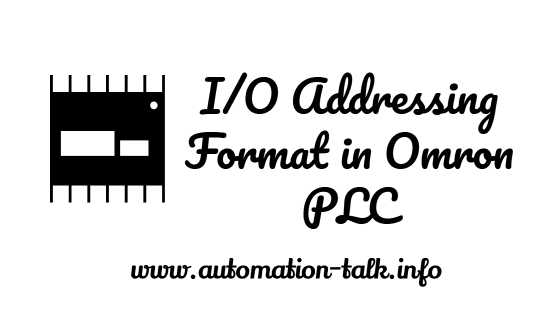 Every PLC have its own I/O addressing format i.e. the address of Inputs and Outputs in PLC. In this article, we will discuss the I/O addressing scheme in Omron PLC and the timer, counter instructions format in OMRON PLC. We will see the addressing of analog Input and Output also and the DATA words and Memory bit addressing scheme. Before going in to the addressing , first of all let us understand the numbers of input and output distribution. The ratio of Input to Output in Omron PLC is always 3/2 i.e if we have a PLC of 40 I/O then there will be 24 inputs and 16 outputs. Note:- Only in Compact PLC. Input Addressing Format:- In Omron PLC there are 12 inputs in one slot so addressing start from 0.0 to 0.11 and then 1.0 to 1.11 and so on. So if there are 18 inputs then address of input will be from 0.0 to 0.11 and 1.0 to 1.7. CPM1A/CPM1A PLC :- 10.0 to 10.7 , 11.0 to 11.7 and so on . CP1E/CP1H PLC :- 100.0 to 100.7 , 101.0 to 101.7 and so on. Work Bits :- As we all know that every PLC have some internal bits to be used in program these are known as memory or work bits. In Omron PLC these are called WORK bits and denoted by W.
Also here one important point to see is that these are used as Bits but if you want to use them as WORDS that is also possible. DATA MEMORY WORDS :- The data memory words in PLC are used to store the integer value or float value. In OMRON PLC these are denoted by D and addressing Format is D0 to D322767. HOLDING REGISTER:- In OMRON PLC the Holding registers are there, it is similar to Data Words except it retains its state even after power failure and also we can use it as Bits or Word. CIO:- CIO i.e Common Input Output , these can be used as Bits or words , it is the same as we discussed before Input and Output Addressing . Note:- The amount of DM , W , H and CIO in a PLC depends upon the PLC memory and vary from PLC to PLC , you can check it in the Memory table of PLC. Timers are extensively used in PLC while developing the program for any application. In Omron there are different types of timer classified according to their Timer Base value like 100ms, 10ms. where :- X is the Timer Number and it is from 1 to 4095.
and Y is the preset value of the Timer. Note :- In Omron PLC all the Timer are count-down , so when the timer starts the value start decrementing from the preset value and when it reaches 0 the timer is HIGH. where:- X is the Counter Number and it is from 1 to 4095 and Y is the preset value of the counter. Very Important Important Note:- The Timer and Counter value can not be same in Omron PLC . For example if you have used TIM 1 then you cant use CNT 1. CX-Programmer is the software used to program the Omron range of PLC. We will see the shortcuts as how to put Input and Outputs in CX-Programmer. To put a NO contact, just press "C" and then write the address whichever you want. To Put a NC contact, just press "/" and then write the address whichever you want. To put an Instruction, just press "I" and write the desired Instruction. We have also mentioned about the the Architecture and SCAN cycle of PLC and Some Basics PLC programs using the OMRON PLC. If still you have any doubts regarding the addressing format in OMRON PLC then let us know through your comments. Do subscribe to Automation-Talk by Email for more such articles. I need to troubleshoot a project, of which code is drawn as a switch 15.15. How to find what (where) it is in the code? (where to look for the all I/Os or physical hardware (/ what memory access) that are controlled by this PLC)? In the project workspace at left hand side you can get all details of memory and I/O. We are using same numbers for timers and counters in cp1e & cp1h models. operations of machine remain normal.